The B-Air Grizzly air mover has a powerful 1 horsepower motor that operates at 3 speeds, in 4 different positions, including a swing out kickstand! This model is CE certified, but it can also come as a UL certified model, with a GFCI outlet. If you are interested in getting this model with a GFCI outlet, you need to call us for special pricing, because it does cost more for the outlet than what this model is priced out at. Another great model that we currently offer that has been independently tested by a Nationally Recognized Testing Laboratory (NRTL), is our 1/3 HP ETL Listed Air Mover. This Grizzly model is manufactured from high quality roto-molded polyethylene for an extended life span. That's how all the high quality carpet dryers are made today. The 3550 CFM of air that this unit moves, is the strongest flow of air movement in the industry. We do not carry a more powerful air mover. Powerful 3550 CFM moves the largest volume of air in the industry. 1 HP motor only pulls 9.8 amps on its highest setting. CE approved for safety requirements in commercial facilities. Swing out kickstand gives you 4 different positions for moving air. Handle designed for balanced carrying and stackability. 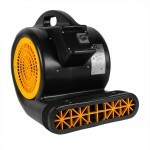 This is a review for the B-Air 'Grizzly' Powerful 1 HP Air Mover.